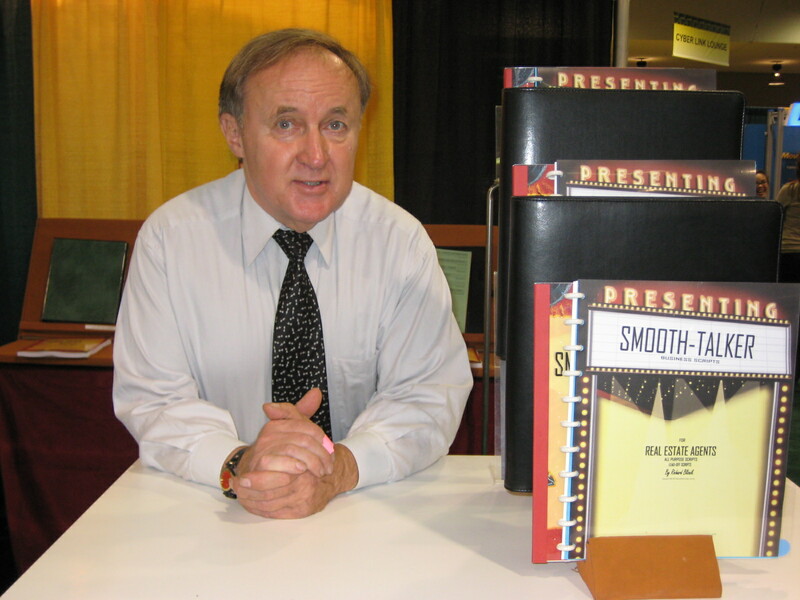 I am the author and writer of a series of sales & prospecting scripts called "Smooth-talker Sales & Prospecting Scripts." I wrote the book; "How To Write Your Own Prospecting Script"
It's 210 pages is about prospecting for new business and how to write your own scripts. PROSPECTING SCRIPTS STARTED IN THE 70'S. The original concept for Smooth-talker was invented with the development of the color-code. It reflected the basic elements of all business conversations. The scripts took off when I developed a unique "color-code method for my scripts. Although Smooth-talker was officially a product for sale in conjunction with my consulting business, it was used as the cornerstone of my training program. The real estate prospecting scripts were offered as part of my consulting & training of a customer contact business known a "MARKETING 2-GO Business Development Co" in Newport Beach California in the early 90's. The need for prospecting scripts became apparent when I learned that salespeople couldn't remember what to say to a prospect. Even though they were exposed to the basic dialoge it training, they couldn't remember it after a few days. That resulted in the fear that they wouldn't have to right things to say. Thus ... the fear of rejection became an integral part of the problem. The problem was that they couldn't remember all the dialogue ... but what was the solution. It took over a decade to figure out why salespeope were reluctant to prospect. When I understood why, I then had to come up with a method & actual product that would work. It was then that Smooth-talker was invented. The rest, as they say "is all history." As the first Century 21 franchisee in 1974 in Farmington Michigan, I had to train sales people in every aspect of real estate in order to be successful. I quickly found out there is an unusually high turnover of salespeople. Being new to the real estate business, I had to recruit and train new salespeople. Fortunately, for all those years, I kept all of my notes for training of the prospecting techniques. No matter how good the real estate training course is ... new real estate agents will often have a poor attitude toward telephone prospecting. It's not the fault of real estate sales trainer or the real estate training course. That's why we have written a special script for the new agents. Real estate sales managers and real estate sales trainers are always on the lookout for real estate training scripts that will result in getting more new business. A real estate sales managers and real estate sales trainers most important job is to find training tools that will be effective. I just knew that my BA degree in Business Education would come in handy someday. Having studied how adults from all walks of life and all sorts of experience & education learn once they are out of highschool and college. Writing the scripts has tought me that adults prefer something simple, effecient, and easy to learn. That is why I chose to write sentences with 10 to 20 words that are easy to speak and are trouble-free to listen to. I try to use one-syable words & avoid long complicated sentence structure. In short .. the scripts consist of short "1-liners." Over the next 17 years I have personally trained over 3000 newly licensed real estate salespeople. I trained them in all aspects of real estate with an emphasis on teaching the listing presentation and the prospecting process. It was the prospecting process which I discovered was the real reason why the salespeople could not sustain their career. They were incapable of obtaining new prospects through making a telephone call. I discovered that the "Fear Of Rejection" was the central issue. Fear ... in all of its incarnations, is the central issue. I knew that I couldn't eliminate fear but I could do something about what causes it. I developed a simple way to color-code the individual parts of the sales presentation. I needed the dialogue written word for word yet be able to stop for questions being asked. A method of “flip-up” cheat sheets started it all. I was seeking a way to allow the salespeople to narrate a listing presentation. If it could be done obscurely, all the better. The color-code theory was further developed and improved during the 80s. I adapted the colors of the traffic signal because of the universal instinct to react to the colors Green, Red, and Yellow. Green pages for when you are talking. Green page headings were meant for getting appointments, discussing money, and getting agreements etc. Red pages to stop talking because the prospect had a question or objection that should be responded. Known as the Q & A. Real estate sales trainers and real estate sales managers goal is to train their salespeople to use the proper prospecting techniques. If salespeople did learn proper prospecting techniques to talk to a potential prospect, after a period of time they forget the prospecting dialogue when they get out in the field. Sales managers and sales trainers mostly teach a "pitch" style of prospecting script. They think that a "pitch" style of sales script is the same as a prospecting script, ...it is not. I decided that I would make it my mission to bring the cost down to an affordable level. My goal was to make sure that even small business professionals could afford propecting scripts. I wanted to provide high quality prospecting scripts and sales scripts at reasonable prices that anyone could afford. I want to give new real estate agents the rules for success and the attitudes to make them successful. To give them the awareness for building a life-long career in real estate. I want to give them the basic dialogue & capabilities for talking to potential prospects. I want them to have a tool (a Smooth-talker Sales Script) that they can use every day for the rest of their career. In addition to the real estate scripts, the company has added several scripts for: business sales of products & services, commercial real estate leasing & listing, financial services, insurance agents, mortgage & loan brokers, and referrals and networking. I learned that all selling shares the same basic process and thus the same words. It was the prospecting process which I discovered was the real reason why the salespeople could not sustain their career. They were incapable of obtaining new business through prospecting. The original concept for Smooth talker became apparent when I learned that salespeople did not know what to say when prospecting. It was fear that became an integral part of the problem. More precisely, fear of rejection and all of it's other names, was at the core of the problem ... but what was the solution?" Over the next 17 years I have personally trained over 3000 newly licensed real estate salespeople. I trained them in all aspects of real estate with an emphasis on prospecting for new listings, the listing presentation, and the sales process. Smooth talker was officially a product for sale in the late 90's. It was used as the cornerstone of my training program. Today I sell these affordable sales & prospecting scripts. The rest, as they say, ... is history!